Champion Electric Inc.’s Service Department offers well-trained, licensed, and fully equipped technicians who are backed up by an operational structure geared to a quick turn around. Our service team is experienced in delivering solutions that are responsive, cost-efficient, and dependable. We stake our reputation on being there with the reliable service you need –When you need it! 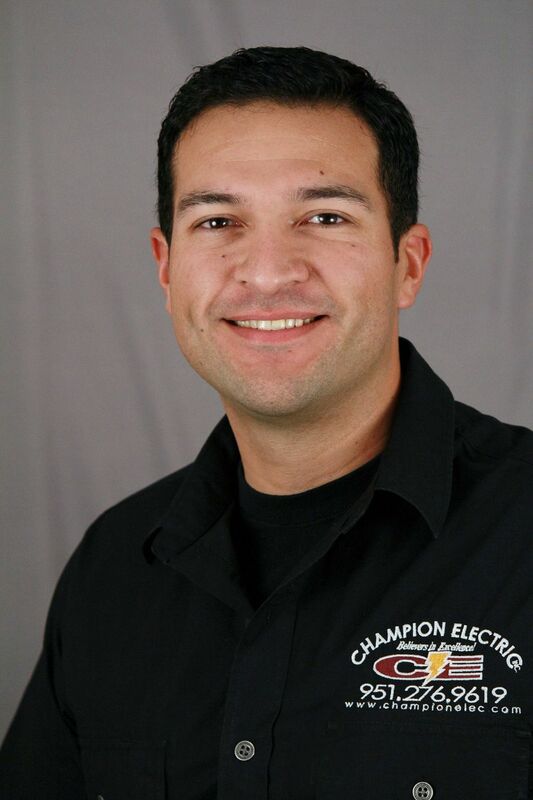 Evan Banda has been a part of the Champion Electric team since 2013 and carries with him almost 20 years of electrical experience. As the Service Manager, he is devoted to continually improving Champion’s Service Department through education and training of the Service team, to cultivate the high-quality products and service our customers expect. From Account Manager, to Service Technician, he keeps the Service Department efficient and consistent with Champion’s high standards as well as ensures all service requests and repairs are made correctly, within budget and in timely manner. Our loyal customers trust the Service Department’s expertise in recommending products and services. As the Service Manager, Evan is dedicated to understanding our customers not just for the current project but for a lifetime of services. His concentration in elevating the personal networking and creation of meaningful, long-lasting relationships with our customers pushes Champion Electric’s Service Department customer service to the next level.